Today's post is one of my most desirable content ever, I am writing this to share with you my idea for a perfect Vacation. I had been to Mauritius last Summer with my husband and I had the most beautifully amazing vacation there which also included a short stay in Seychelles. But that'll be discussed in further posts. Mauritius is one of the world's top luxury tourism destinations.It possesses a wide range of natural and human-made attractions, enjoys a tropical climate with clear warm sea waters, attractive beaches, tropical fauna and flora complemented by a multi-ethnic and cultural population. These tourism assets are its main strength, especially since they are backed up by well-designed and run hotels, and reliable and operational services and infrastructures. Mauritius received the World Leading Island Destination award for the third time and World's Best Beach at the World Travel Awards in January 2012. 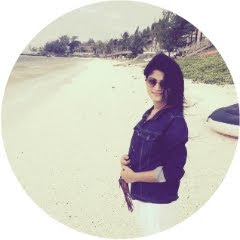 There's Something About Mauritius ! Its an Island in the Indian Ocean about 2000 kilometers off the southeast coast of the African continent. The people of Mauritius are multiethnic, multi-religious, multicultural and multilingual. The island's government is closely modelled on the Westminster parliamentary system, and Mauritius is highly ranked for democracy and for economic and political freedom. Along with the other Mascarene Islands, Mauritius is known for its varied flora and fauna, with many species endemic to the island. The island is widely known as the only known home of the dodo, which, along with several other avian species, was made extinct by human activities relatively shortly after the island's settlement. It was a six nights and seven days package, We boarded an International flight (Ethiad Airways) from Mumbai airport and after two connecting flights we reached to Mauritius International Airport, where we were assisted to Four Seasons Resort Mauritius at Anahita Coastal Road Beau Champ. After arrival rest of the day was a leisure time to explore this beautiful city on our own. The sparkling crystal in the turquoise waters of the Indian Ocean was fascinating. The contrast of colors, cultures and tastes makes the Island so charming that the scene is set for an unforgettable holiday. After exploring a bit of it on our own was so much fun soothing. We ended our day with a delicious Seafood Cuisine. After breakfast we proceeded to explore the northern regime of the island where we were assisted by a guide and a car for transport, visited Fort Adelaise - Citadel, Round of champ de Mars, Marie Reine de la paix, Mall of Mauritius - Bagatelle and Caudan waterfront, Shopping complex and lastly to a craft market. In the middle of our journey we also enjoyed the delicacies of food famous in Mauritius. After a lavish breakfast we moved on to a south island tour to La Vallee des Couleurs Nature Park, for a full day tour of exotic Southern region of island. Visited floreal shopping complex, famous Volcanic crater - Trou Aux Cerfs It was the most amazing view I've ever seen in my life. Next was a Grand Bassin Shiv Temples and Visited to LA Vallee des Couleurs Nature Park. It was a hectic day but we enjoyed to the core and ended up collecting lot of beautiful and unforgettable memories. There was excitement every single day to explore this beautiful island. After breakfast we proceeded to lle Aux Cerf Island, There we experienced a thrilling speed boat ride across to the island, revealing the beauty of fine white sand and crystal clear blue waters. The rest of the time was given us leisure and explore the various water sports activities. It was again a beautiful day spent and the most special part of that day was the food that was available on the island. It was a deliciously fried lobster with loads of salad and dressings. On this day after breakfast we headed to the capital city of Mauritius, Port Louis is the country's economic, cultural, political centre and most populous city. I was so impressed with the structures and the ambiance of the local restaurants. Streets of the market were so well maintained and decorated, It was all adorable and unforgettable. Port Louis is also good to explore varieties of food available. I also shopped a lot from the locals which included varieties of fruits, perfumes, pair of footwear and also colorful shades. 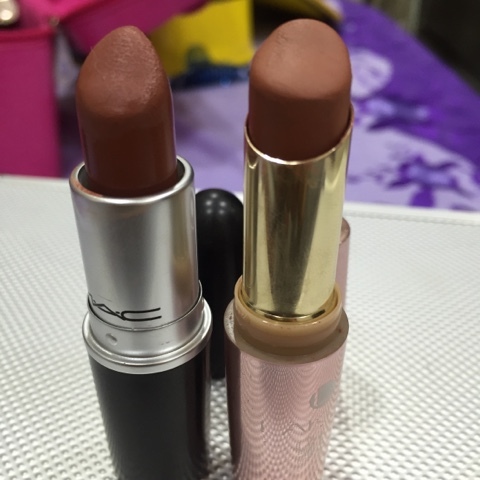 They were super cheap and affordable. For people like us who just love water sports couldn't get enough in just one day so we decided to go and explore every single water sport available there. After having an Italian breakfast we headed to our water sport routine where I went crazy about Kitesurfing, Parasailing, Under water walk, Scuba diving, Speed boat ride, Banana boat ride and last but not the least our Submarine ride which was just amazing. I had never experienced something like that before, So it was all totally a new experience that just felt wow ! Though there were few very expensives rides like Submarine, scuba diving, Under water walk which almost costed a lac for a couple but trust me, It was worth. As it was our last day in Mauritius we had to just go and shop, we headed to Port Louis market again and this time we got all the antiques available there like sand work in a glass bottle, dresses that were handcrafted and again lots of fruits :p It was a wonderful wrap with such beautiful memories and experiences. If you prefer balmy weather and lukewarm ocean water, like we do, I suggest visiting in their summer (November to May). The wind is also calmer during the summer, which will provide those glassy ocean conditions which are perfect for surfing, SUP and kayaking. However, if you like mild temperatures or any water sport that requires wind, such as kitesurfing, then winter is the time to visit. So after travelling for a couple of years, we've come to trust and rely on a few websites to help us find the best deals on flights and accommodation. Yatra.com is the first place we check when searching for cheap flights. It searches for the best fare and includes both standard and budget airlines. The price calendar feature shows the cheapest days to fly in your preferred month of travel. Thank you for stopping by and reading my guide to Mauritius, I hope it help you to decide your dream vacation or holidays. For more travel blogs, stay tuned and keep visiting. I haven't posted anything for a while now and thus thought of putting up my monsoon haul on the blog. As we are in the end of July its pouring outside with beautiful humidity everywhere around, My hair feels so soft and smooth I just love monsoon especially because it makes my hair naturally feel soft, silky, shiny and smooth. But when it comes to skin Its not that adorable and I have to change every single product I use, from face wash to face mask, moisturizer and everything else related to skin. 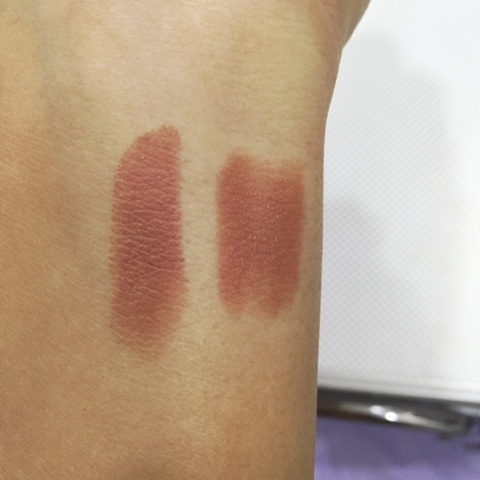 I have a very sensitive skin which lead to careful choices to make henceforth I go for products that are not that harsh on my skin. I've got a couple of stuff which includes Shampoo, Conditioner, Body wash, Face wash, Face scrub, Hair oil and a Lip balm. To know more keep reading. Price : Shampoo - 725 INR Conditioner - 725 INR for 385 ml each. Its an ancient Hawaiian secret for frizz free, incredibly smooth glossy hair making everyday a 'good hair' day! 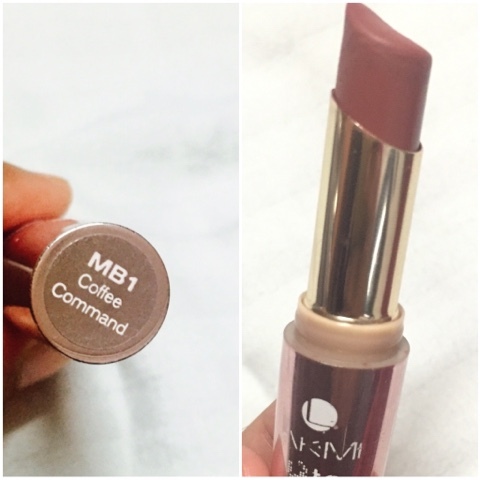 This humidity resistant blend helps to create a shimmering gloss, smooth texture and repel humidity. 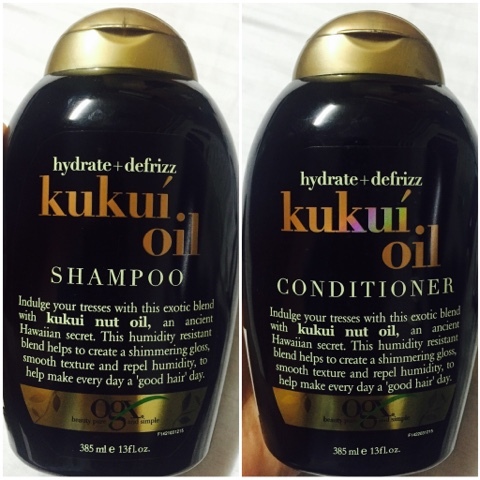 Using both shampoo and conditioner hydrates and defrizz and it is perfect for monsoon. 2. 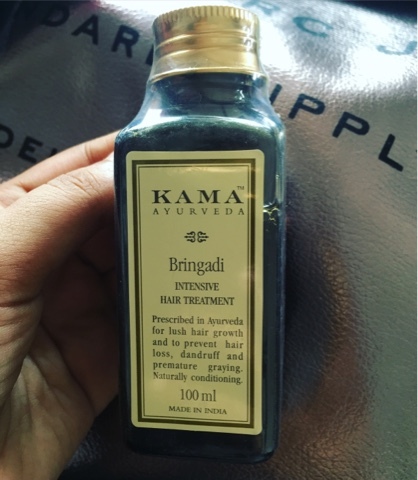 KAMA Ayurveda Bringadi Intensive Hair Treatment. Price : 515 INR for 100 ml. Recommended in the ancient sahasrayogam Ayurveda text for lush and healthy hair. It thickens hair while adding body and shine. Removes loose dandruff flakes. Naturally conditioning. The secret of luxuriant, glossy hair. This combination of herbs, processed in pure sesame oil and milk, includes indigo (neeli), eclipta alba and gooseberry, said in Ayurveda to promote hair growth. Balloon vine helps maintain a healthy scalp. Liqorice with its antiseptic properties protects against bacterial and fungal infections. 1. 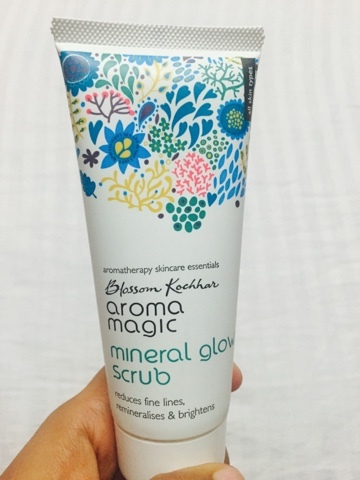 Blossom Kochhar aroma magic Mineral Glow Scrub. Price : 160 INR for 100 ml. As I have mentioned in the beginning itself that I have a very sensitive skin and this scrub is a 100% free of harsh chemicals, alcohol, parabens, phthalates, sulphates, artificial colouring and fragrance. Its triple action scrub formula made of natural exfoliators of cornflower and grain almond meal gently buffs away dry skin and dead cells resulting in fresh, young, energized and healthy skin. Rice bran oil and aqua minerals remineralise and enrich your skin reducing fine lines effectively. Its aromatherapy blend of tea tree, rose and lavender essential oils helps to balance the level of oil in your skin and protects it from daily pollution and dirt. The goodness of moisturising agents like beeswax and glycerin keeps your skin smooth, radiant and nourished. 2. 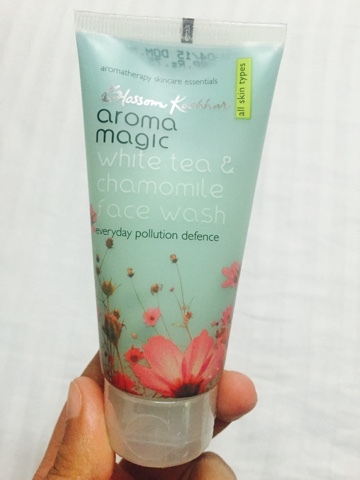 Blossom Kochhar aroma magaic White Tea & Chamomile Face Wash.
Price : 145 INR for 100 ml. Its 100% free of paraben, soap, alcohol, artificial colouring and fragrance. It deep clean your pores with white tea and soy milk extracts & exfoliating micro beads. It prevent ageing & protect skin from free radicals. The chamomile essential oil soothes & calms, leaving your skin fresh & relaxed. Its a great everyday pollution defence. 3. 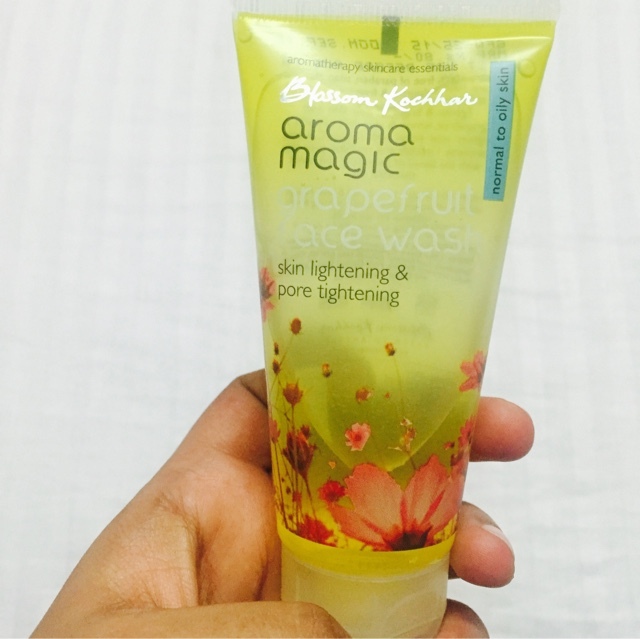 Blossom Kochhar aroma magic Grapefruit Face Wash.
Its 100% free of paraben, soap, alcohol, artificial colouring& fragrance. It cleans, lighten & brighten your skin with grapefruit, lemon & aloe vera extracts. It also tighten your pores with vitamin C &beta carotene. It mattify and revitalise your skin with the blend of palmarosa and neroli essential oils. It great for skin lightening and pore tightening. 4. 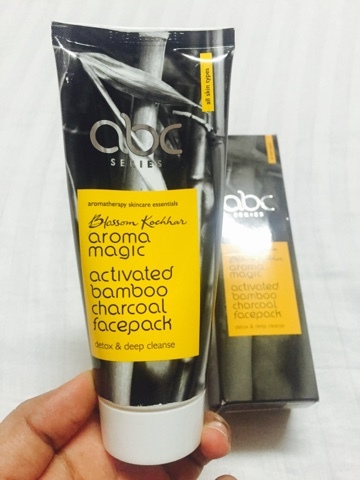 Blossom Kochhar aroma magic Activated Bamboo Charcoal Facepack. Price 475 INR for 100 g.
It transforms your skin in 6 miraculous ways. It lighten and brighten the skin instantly by exfoliating dead skin cells. 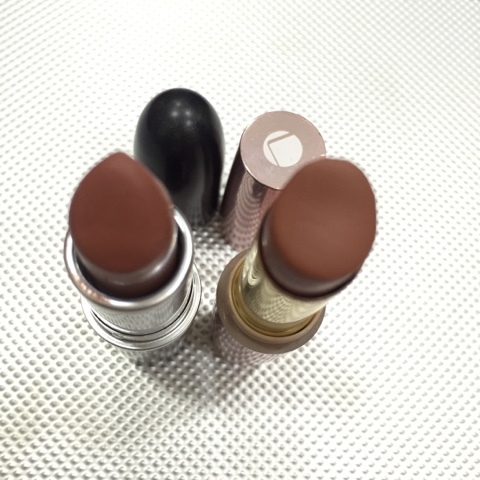 It deep clean with activated carbon that draws out dirt, oil and makeup. It nourish with minerals and vitamins in Himalayan clay. It protect with the anti bacterial shield in organic essential oils. It gently smoothen and tighten pores leaving your skin younger, fresher and radiant. I highly recommend it to everybody not just for monsoon but for all the seasons. 5. 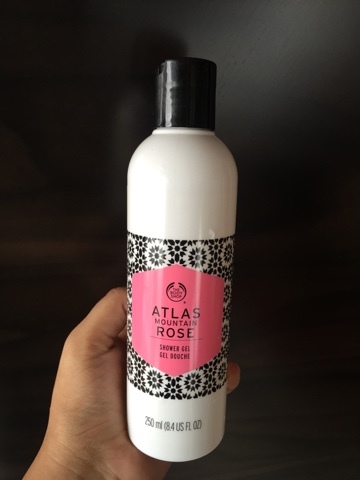 The Body Shop Atlas Mountain Rose Shower Gel. Price : 695 INR for 250 ml. After using Japanese Cherry Blossom I was eagerly waiting to try this one. It's like you escape to the valley of roses. A refreshing body wash infused with Atlas Mountain Rose. This bright, dewy blend of floral accords was inspired by dawn in a field of blossoming roses. It has Floral scent, Refreshing and cleansing, Soap-free And you can layer with other Atlas Mountain Rose products to build the fragrance. 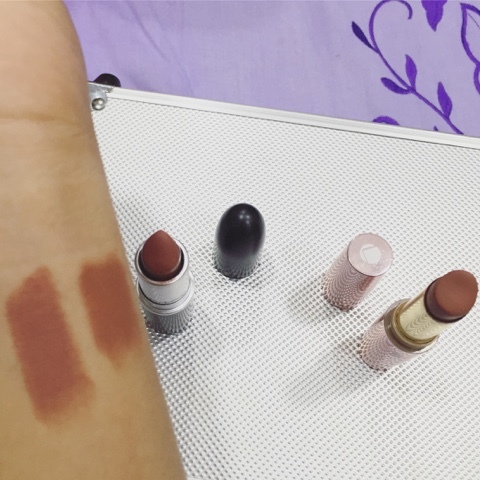 I hope you enjoyed reading this post and somewhere helped you in choosing your monsoon essentials. Thank you for stopping by and reading.